At the top of the list of best airports, by a long way, was Amsterdam’s Schiphol. I have not flown into Schiphol myself, but I’m not at all surprised by this ranking, as the Dutch are genius urban planners. Schiphol has a branch of the Rijksmuseum art museum, displaying actual old masters, and a shopping mall which is open to the public as well as travelers. Among American airports, high scorers were Charlotte (rocking chairs in the terminals), Austin, Baltimore-Washington, San Francisco, Denver, Tampa, Detroit (“so pretty, and well-designed, that main water fountain is gorgeous; maybe I just liked it because I had low expectations going into it, being Detroit”—xq), and Portland (has a mall with stores forbidden to charge prices higher than their off-airport locations, and live pianists). As I’ve discovered, there are tremendous merits to flying in and out of smaller airports, like GSP here in Greenville. As reader Q notes: “in general, small town airports are just a vastly more pleasant experience than the big ones.” Tops in our survey must be Fort Wayne International, where volunteer greeters meet incoming passengers with free cookies. As one of you pointed out, this survey is subject to sampling bias based on the fact that many more of us have been through large, hub airports close to home (e.g. O’Hare, Atlanta, Denver, Dallas) than smaller and/or more distant ones, making it more likely that the major American airports are high on these lists. This proved true—for the worst list. Relatively few people listed the major American airports among the best, with Denver and Charlotte making the best showing. Waits at LAX are long, and it is not unheard of for security lines to run out of the security area, down the steps, through the check-in area, and then out of the building to snake back and forth on the sidewalk in front of the terminal. I personally have had to wait in such a line. Eventually, airport personnel came and pulled all of the people with later flight departure times, of which I was one, out of the line. We were rewarded with a long walk to another terminal (no train between terminals at LAX, only an infrequent, maddeningly slow and crowded shuttle bus), going through security there, then being herded out onto the tarmac and onto a packed shuttle bus back to our original terminal. The wait and inconvenience was bad enough, but what turned ordinary hassle into truly Kafkaesque hassle was the fact that airport personnel insulted our intelligence, luring those of us with later flights out of line by telling us we were going to have our screening “expedited,” as if they were really going to expedite the people on the later flights. And believe me, there were no free cookies for our trouble. Thanks to those of you who wrote in! This was a very interesting read. I have traveled a lot within the US, and well, have had layovers in most of the continents. It wasn't a surprise to me when I saw Heathrow as the worst. When I was travelling back to Nepal last December, I had a 12 hour layover in Heathrow. I was literally bored to death. The seating were also uncomfortable. No place to plug in even your phone or laptop. And the worst was when I saw a black rat run out from a hole in the wall into another. That was when I realized that at least Nepal's International Airport doesn't have rats running around! LAX has free WiFi and several of the terminals (Tom Bradley Intl being the most prominent) have been completely remodeled. When's the last time you've been? Yes, I tried to take the shuttle bus to LAX once. It was 45 minutes late, so I missed my flight. I live in LA and have flown out of LAX for round trips maybe 3-4x/year for the past 7 years and on several occasions before that as well. Maybe I've just learned how to work the system, but I think LAX gets a lot of undue criticism. Granted, it has a lot of disadvantages, such as parking, pick-up/drop-off, shuttles, etc. But I have not had to wait for a long time to get through security at all recently, even for Thanksgiving and Christmas. The past few years for the holidays I've been through security in 5-10 minutes, tops. I think the LAX experience is highly airline-dependent. I generally fly Southwest, and I think that terminal is particularly well organized compared to the others. I've had less fluid experiences with Air Canada, United, and to some extent Delta. It's an old airport that sees a huge amount of flights on a daily basis, with no room for expansion anywhere. I don't think it's fair to be both frustrated with things being old and dirty AND with perpetual construction. You can't solve one without the other! Lastly, I think LAX has one of the absolute best visual experiences on take-off and landing. That goes a long way for me, an avid window-seat sitter! As a side note, I don't understand why Denver gets so much respect. Short layovers there are a beast because the gates can be so far apart and often in a different terminal you have to take that tram to. They handle the distance pretty well with moving walkways and the trams but it still takes a while to get around. My worst wait times for security that I can remember have all been at Denver as well, and this coming from a frequent LAX traveler. Finally, the mountains can cause quite a bit of turbulence on take-off and landing which isn't very pleasant. I do like the city, though. I have had good experiences at San Francisco, Portland, and Vancouver. Forgot to mention... Singapore is by far the best airport I have ever been to. Tokyo is pretty nice as well! I have to use LAX regularly and dislike it very much, for many of the reasons mentioned in the article. I will gladly pay extra and take a stopover just so I can fly in/out of Burbank airport instead. One of the reasons I dislike LAX so much that hasn't been mentioned is the segregation of the terminals. In most other airports, once you clear security, you can wander around from one terminal to the other. So anyone with time to kill can walk further, check out the different dining options and stores, etc. But in LAX you're usually stuck in a small area with limited options and no access to other terminals unless you exit the secured area and then clear security again at another terminal, before heading back to your own terminal. Considering how long the lines usually are at LAX, this isn't practical. LAX has an identitification crisis. Eight numbered terminals but one terminal named the Tom Bradley International Terminal (no number). However, there are actually six international terminals and many people go to the wrong terminal because of the confusing Bradley name. Air China arrives and leaves from Terminal Two; China Airlines from Bradley. Air France leaves and departs from both Terminal Two and Bradley. Virgin Australia ticket counter is Terminal Three but the flights arrive in Terminal Five. United international flights are at Terminal Six or Seven. QANTAS leaves or departs from Bradley or Four except that its New York flight leaves from the International terminal. The multi-million dollar remodeling of Bradley was completed over a year ago; the billion dollar remodeling of Bradley is now underway. 99% 0f the users of the Green Line train are employees; very few passengers want to lug their baggage through subway stations and shuttle busses to the arrival level of their departing flights. San Diego's airport is right downtown, walking distance in fact. The trade off is that landing there you are literally looking over people's shoulders in down town office buildings because the planes are coming in below the building roofs. I like John Wayne airport in Orange County mostly because of the larger than life statue of the Duke. I'm surprised nobody mentioned Birmingham, AL, where the monitors have been known to attack and kill passengers . . .
Schiphol ? It's just ok. My fav's are Detroit and Hong Kong. As a business traveler, i just care about getting in and out fast. Hong Kong is among the best, especially for business travelers. Plenty of food, free wifi, well organized and great shopping before you go. Singapore is also very good, part of the problem with many US airports is all the terminals which make transfers inconvenient. Someone also mentioned Detroit, I was pleasantly surprised on my most recent visit there, although some of the waiting areas at the gates are too small to contain the crowds. JFK and Newark are not among my favorites. Love the piece, but not a mention of YEG, AKA Edmonton, to be found. (You know, in Alberta...Canada. The northern-most major city in North America?) Anyway, Edmonton has been investing in redevelopment of it's airport for several years and the result is one of the best in North America. Come visit us in YEG one day and experience for yourself one of Canada's (and North America's) best kept secrets. If you can't make it, check out #YEG in the Twittersphere. 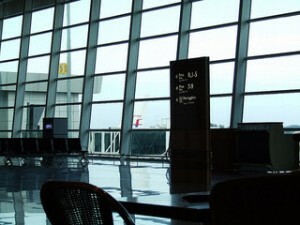 The only things I really expect from an airport are a place to get a bite to eat, a place to get a book/magazine/stick of gum for the flight, a comfortable-ish place to sit, enough space that the whole terminal doesn't feel like a giant, packed subway car, and reasonable modicum of cleanliness. Anything else is gravy. The places that have fallen short of my not-too-high standards are: the Delta terminals at JFK and LGA, Heathrow, Berlin-Tegel and Sao Paulo-Guaralhos. Everything else has been OK. SFO and Charlotte are pretty nice. The Delta terminal at JFK is the worst of all those - it's absolutely horrible. It's as crowded as a subway station, there's nowhere to sit, all stores are jam-packed, the roof looks like it's about to collapse. However, I'd like to note that JFK varies a lot depending on the terminal. Terminals 5 and 8 are mostly fine, albeit with long security lines, Terminal 4 is actually kind of nice. « Previous PostWhy Doesn't the Government Fix Sporting Events?